When do you put aside summer sewing and move onto fall and winter apparel? Is July too soon to think about cool-weather clothes? I must admit I have actually begun to think about my Fall wardrobe in July for the first time ever. I have even begun to look at Fall Runway shows on Style.com and even started a Mood Fall board, but……… hasn’t summer just begun? I may develop the discipline to sew a season ahead one day, but for now I’m sewing in the moment. 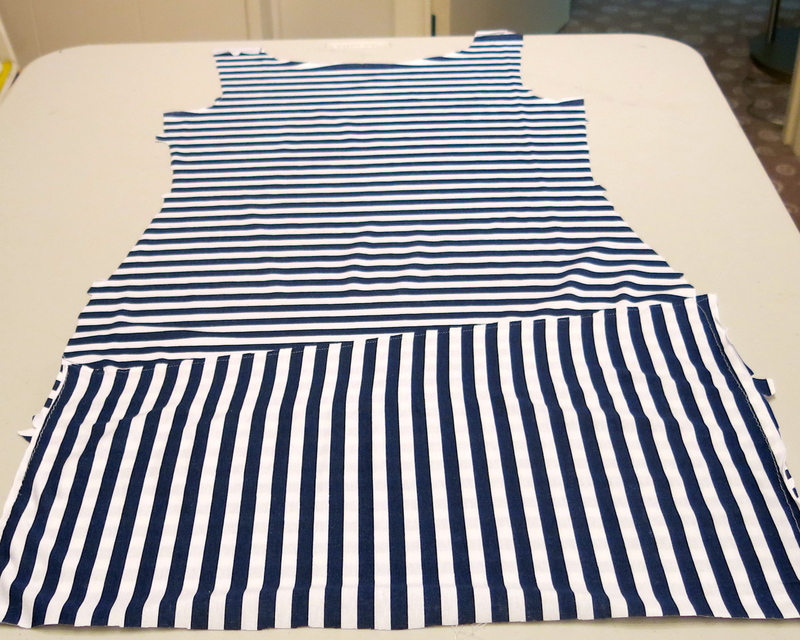 As a confessed blue and white striped addict, I couldn’t pass up this light weight navy and white striped jersey from Mood Fabrics……. and I sure couldn’t pass up the new Marcy Tilton Vogue pattern. It just looked like so much fun! 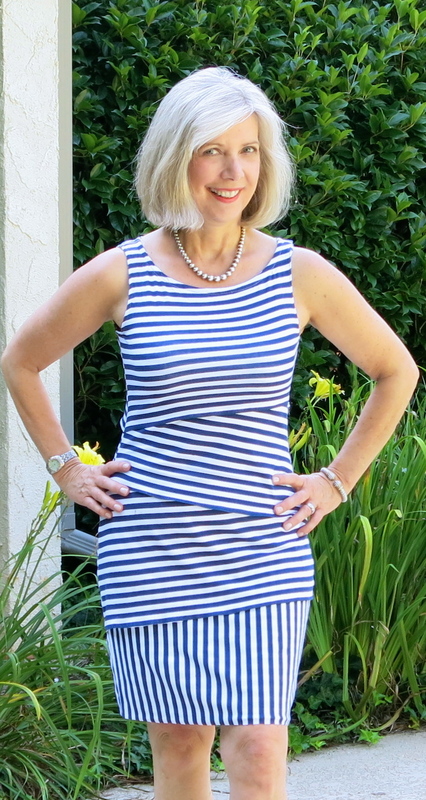 I was delighted to discover the dress was as fun to make as I thought, and I made the dress in a day. After cutting two main front and back pieces, the “shingles” were layered and stitched one by one working from the bottom towards the top. The pattern is designed to fit with negative ease which slightly scared me, but the additional shingled layers of fabric disguise the body hugging under layer. The directions state to leave the raw edges exposed, but I turned and machine-hemmed all of the layers adding another 30 minutes to the project. Since my fabric was lightweight I didn’t want to chance the edges curling. and with over 9 weeks of summer left, I’m sure lots of opportunities for wear will arise. But I must say……. 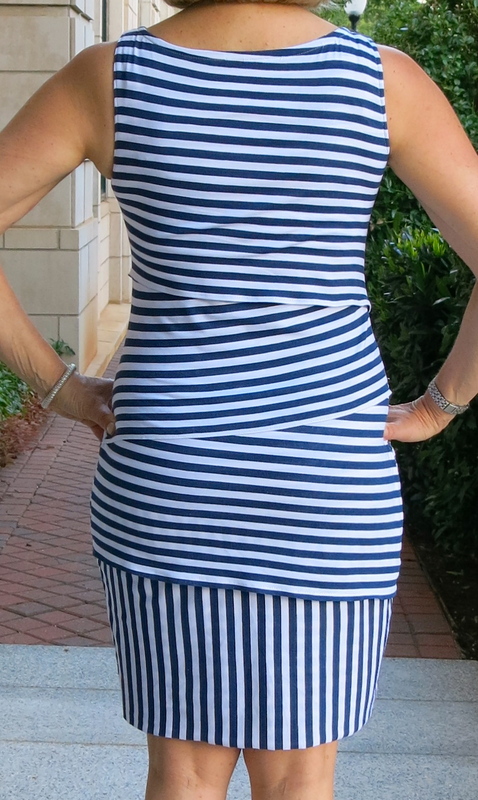 if any sewing excited me about the fall, it was this dress. Why? I picture the longer sleeve rendition in a cool weather jersey bringing me a step closer to fall sewing ……possibly before September 22!